PRAGUE -- Japan's first navigation satellite has arrived on station more than 20,000 miles over Asia to improve positioning coverage in mountainous terrain and urban centers. The Michibiki satellite entered its quasi-zenith orbit early Monday, Japanese time, the country's space agency announced. The orbit stretches from a low point of 20,268 miles to a high point of 24,202 miles. The quasi-zenith orbit, designed to maximize Michibiki's coverage of Japan, has an average altitude equal to the distance of geosynchronous satellites from Earth. Its longitude is locked in at 135 degrees east longitude. Michibiki means "guiding" or "showing the way" in Japanese. 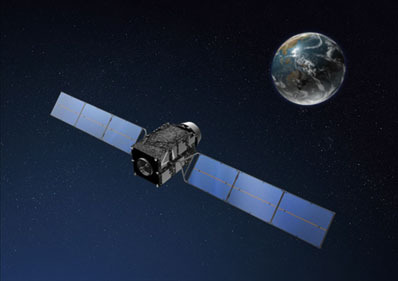 The satellite has three more months of technology tests and commissioning before it enters service. Michibiki blasted off Sept. 11 from the Tanegashima Space Center on an H-2A rocket, reaching a temporary transfer orbit less than 30 minutes after launch. The satellite fired its main engine five times over the next six days to reach its prescribed orbital altitude, then controllers allowed the craft to drift until it reached position over Japan. Projected against Earth's surface, Michibiki's ground track charts an asymmetric figure-eight pattern stretching from Japan to Australia as it alternates north and south of the equator. Michibiki will be near-zenith, or almost straight up, in the Japanese sky for about eight hours each day. If launched, two follow-on satellites would permit continuous coverage of Japan. Japan's satellite navigation program aims to augment signals from the U.S. Air Force's Global Positioning System, a network of spacecraft circling 11,000 miles above Earth. Although there are 30 operational GPS spacecraft, only a small fraction of the fleet is visible from a single point on Earth at one time. A navigation terminal on the ground needs four GPS satellites to compute the user's position, elevation and local time, but skyscrapers and mountains in Japan often block line-of-sight signals from spacecraft low in the sky. Japan hopes to resolve the issue by launching up to three of its own satellites strategically positioned high in the sky over the country, where their signals will not be impeded by manmade or natural terrain. Officials will look at results from Michibiki before committing to launching the next two satellites.